Katrina Tulloch at syracuse.com posted an article early this morning about a new immersive technology exhibit that attendees of this morning’s TACNY Jr. Cafe Scientifique were able to immerse themselves in for free. The second screen, “The Unseen Sun,” uses continuously updated information from NASA’s Solar Dynamics Observatory to create an interactive sun. By waving their hands, people can “change” the sun’s colors and examine the sun’s different temperature levels. Furthermore, if you’ve not taken an afternoon to expand your mind (or your kids’ minds), The MOST has quite a bit of really good astronomy education happening in its lower floors as permanent installations. Well worth the admission price. But you can also explore on the cheap! As attendees to TACNY Jr. Cafe Scientifique lectures know, your attendance comes with a free admission to all of the floor exhibits for the afternoon (then use the savings to pick up a model of the Space Shuttle on your way out!). Before closing this post up, I’d like to extend a sincere thanks to both Katrina Tulloch and the ever-cumulonimbus Dave Eichorn at syracuse.com for regularly posting items of local science (and, specifically, astronomy) interest. If you missed it, Dave’s recent “Anatomy of a beautiful sunset over Central New York this evening” post distilled a nice bit of astronomy, meteorology, history, and photography in one fell swoop. You can get their direct feeds by subscribing to their twitter feeds (as the @cnyobs account does): @katrinatulloch and @DaveEichorn. A view to the Southwest from the Baltimore Woods parking lot. 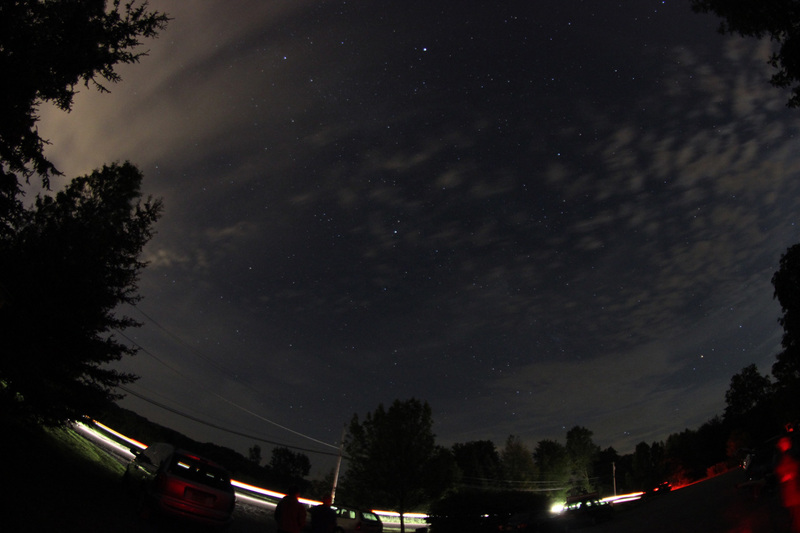 The peak of the Perseid Meteor Shower this year turned into a pair of observing sessions for several CNYO members. Both sessions, I am happy to report, included the observation of several Perseids by attendees and good-to-excellent clear, dark skies. Following the first of several updates on Perseid weather conditions by Dave Eichorn (LINK 1 and LINK 2) at syracuse.com and the event itself by Andrew Donovan at NewsChannel 9, Larry Slosberg and I met up with Bob Piekiel at Baltimore Woods for their official Perseid Session that CNYO was delighted to have listed as an International Starry Night event (see that background for this event HERE). The partially-to-mostly overcast skies all afternoon opened up around 8:30 p.m. (as Eichorn had predicted) to give us over two hours of excellent clear skies. The total (and limited) equipment list for this session reflected the Perseid-centric nature of the session. 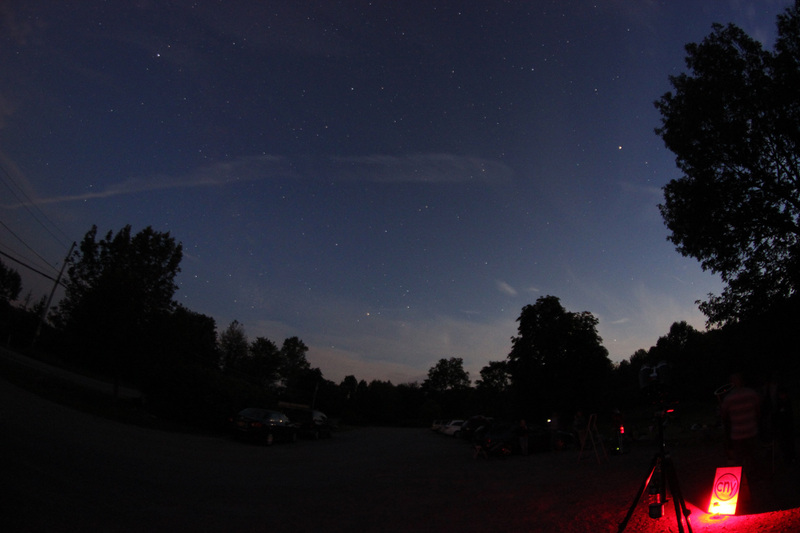 Bob brought an his 11″ SCT, Larry brought his NMT 12″ Dob, and I brought my Zhumell 25×100’s and, again, a Canon Rebel T3i in the hopes of capturing a Perseid or two. Most importantly, all three of us had reclining chairs in tow for the end of the session (after our respective scope duties were completed for the evening). A view to the south from the Baltimore Woods parking lot. A total crowd in the 35 to 40 range observed a total of 25 meteors over the two-hour session (9 p.m. to 11 p.m.) before clouds began to roll in. Those not reclined for the Perseid count were treated to some excellent scope views (Saturn and Venus being the early evening stand-outs), two ISS flybys at 9:00 p.m. and 10:30 p.m. (both on the dimmer side but both captured and followed by several attendees), one very bright Iridium Flare, and lots of airplane traffic from the Southwest. I was fortunate to have several intrepid young observers around me for the observing session, so I spent quite a bit of time describing constellations and Messier objects and adjusting the big binos (and step stool) as the discussion progressed. Binocular views for the evening included Saturn (for comparison with the big scopes), the Moon, Albireo (with quite the neck strain to capture to color differences in these two stars), Alcor and Mizar in the handle of the Big Dipper (to show another binary star system and the additional detail one gains from magnification), and a pre-nova Brocchi’ Cluster (the “Coathanger”) in Delphinus (to show how low magnification can reveal interesting objects that higher magnification simply won’t show in the eyepiece). 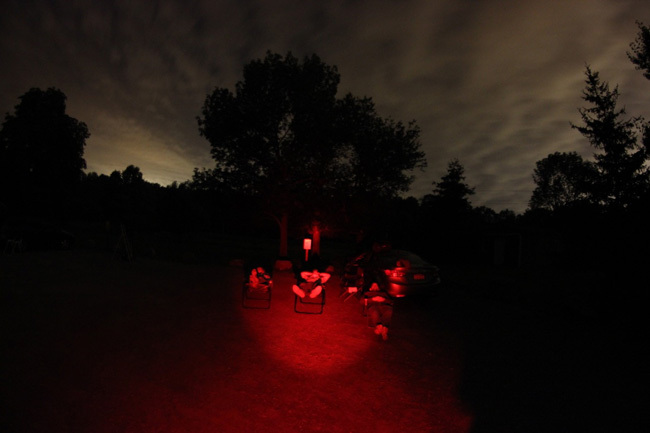 One of the “unavoidables” of observing sessions is the late arrival of attendees and their headlights, made all the brighter by the sensitization of observers already dark-adapted. One of the only problems with Baltimore Woods as an observing location is the proximity of the scopes to the front gate and parking lot. Two of the attendees were captured reacting to a later arrival (I dare not call them “late arrivals,” as everyone was there late) in the .gif above. Their captured (and long-held, as these were several second exposures each) poses speak volumes. Bob, Larry, and I in inaction action. The crowd left around 11:00, leaving Bob, Larry, and I to enjoy a half-hour of scope-free meteor hunting as the clouds rolled in (maybe 3 total for the 1/2 hour). With a large patch of thick clouds moving in around 11:30 p.m., Bob began to pack up his gear. I had left the camera to capture images throughout and was able to capture one clear patch opening up just as Bob drove off (posted as a youtube video of the event and embedded below).